I am currently using Ubuntu 10.04. I know there is a 10.10 release, but can I upgrade directly to 11.04? Could you walk me through the steps please? Ubuntu only supports upgrading from one version to the next version, or from one LTS version to the next LTS version. So you need to upgrade from 10.04 to 10.10, and only then to 11.04. There are technical reasons for this restriction. When a new version of an existing package is installed it sometimes has to perform conversions, e.g., it may have to import existing settings into a new database format. In performing such conversions the packaging scripts have to make assumptions about the old format. If upgrades from all previous versions of Ubuntu were supported then this would quickly become a maintenance nightmare, as packaging scripts would have to be able to convert from all previously used formats to the current format. To avoid the nightmare, packaging scripts only in general support upgrading from the version of the package included in the previous Ubuntu release (and from the previous LTS release, in the case of a package included in an LTS release). Upgrading directly from the penultimate, or earlier, version to the current version (called a "skip upgrade) is possible, but is liable to result in a misconfigured system. To update from an older version (very old in this case) than the previous version to the current version is highly not recommended. You are better off downloading the new release, doing a backup and then installing the new release. If you are using Ubuntu 10.04 and REALLY REALLY want to update from that version up to the latest version then keep reading, if you are using Ubuntu 10.10 and also want to update from that version up to the latest version go to the second part. I should warn at least users from 10.10 that this involves downloading more than 2GB of data and will take you around a whole day. And even at the end it might be slower, give you errors, your connection will drop at some point or the computer will go crazy. This means that I do not give a guarantee that it will work flawlessly on every PC. So really think about it if you want to upgrade this way. 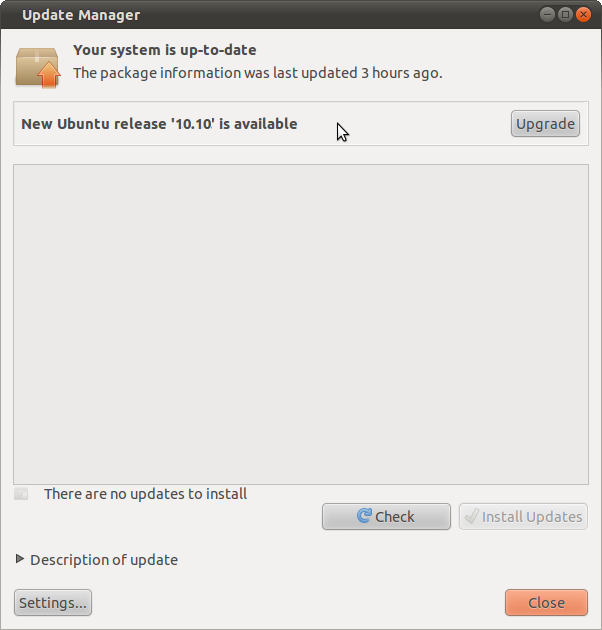 I recommend reading this link: How do I upgrade to a newer version of Ubuntu? UPDATE - if you are reading this after 12.04 came out, there should be an option in the Update Manager in 10.04 that says to upgrade from 10.04 to 12.04. This is the way to go since 12.04 came out. For historical reasons I will leave the information below for users that wanted to know how to do it before 12.04 came out but if you are still in 10.04 please read here: How do I upgrade to a newer version of Ubuntu? since fossfreedom created a very good and complete answer about upgrading from 10.04 to 12.04. 1a. Using the menu go to System -> Administration -> Update Manager . 2- Click on the SETTINGS button in the Update Manager on the lower left part of it. After the Software Sources Windows opens it should have you in the Update Tab where you will change the option Release Upgrade at the bottom. Change it from the one that it has to Normal Releases then close. What you did here was tell Ubuntu not to check for LTS versions but to check for normal version instead. Normal versions are the ones that come out every 6 months. LTS come out every 2 years. For example 8.04, 10.04, 12.04..
2.1 Open The Update Manager again following the Steps in 1a or 1b. Click on the UPGRADE button and follow it through. IMPORTANT - Make sure you have ALREADY updated everything in Ubuntu 10.10. So you are ready for a clean upgrade to 11.04. NOTE - From LTS to LTS you can actually update. For example 10.04 LTS to 12.04 LTS. But for any other like 10.10 you need to actually update from one release to the other until you get to the final one. In your case, before 12.04 came out you could update from 10.04 to 10.10 and then 10.10 to 11.04 and so on until 11.10. 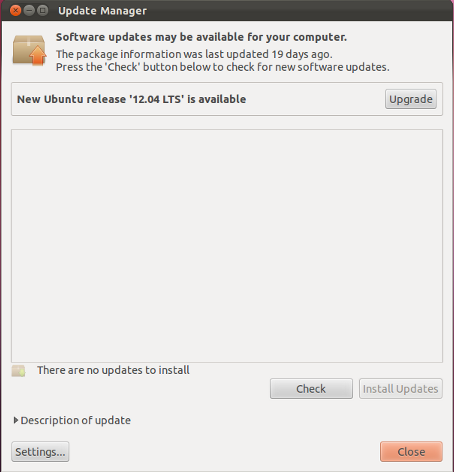 After 12.04 came out you can update directly to 12.04 since it is the next LTS released. The only "point to point" release upgrades which work outside of the standard release to release upgrades, are LTS release upgrades. In other words you can upgrade from 8.04 -> 10.04 and 10.04 -> 12.04 without having to upgrade to each of the three other non-LTS versions in between. Otherwise you'll need to go next to 10.10 then to 11.04. Since you're not too far behind it shouldn't take long. Simply run the update manager as you normally would and follow the chain to 11.04. If you were to try, you could simply pop in an 11.04 disk and install over the 10.10 installation. This should keep all of your home folder contents intact but will result in you having to re-install all of the software you had prior to the "re-installation"
You cannot skip versions between upgrades. The version between Jaunty and Lucid is Karmic. I suggest you do backup important data and do a complete reinstall as many things has changed, including the boot loader. If you do not like a fresh install, you can upgrade using an Alternate CD. If you try to force an upgrade you could most likely break your system - files may not be upgraded or updated and most likely you will have a very strangely behaving system or even a system that wont boot. I've also seen various people try to backup the /home and restore it on a fresh install. This does usually work - however - I personally prefer to do a clean fresh install a copy specific files from backup. The advantage of just copying specific files is that you clean out all the rubbish you've accumulated over the years. You'll need to upgrade to 10.10 and then to 11.04. You can use update-manager, but you can also use do-release-upgrade from the command line. You can repeat the upgrade process to get to 11.04. You can do the method above without having to install apache or changing /etc/hosts. Just save the meta-release file from wget somewhere (except on top of /etc/update-manager/meta-release) and edit it as described. Then, in /etc/update-manager/meta-release, change the "URI = http://....." line to "URI = file:///path/to/my/edited/meta-release/file"
Thanks this solved problems I was having with upgrading an old system. However, there one enhancement that I used that will make this a lot easier - you don't need to install apache. Simply use a file:// URI instead of an http:// URI. Edit meta-release file in your home directory with your favourite editor so that the "Supported: 0" line in the karmic block now reads: "Supported: 1". The nice thing about this is that there's no need to install apache and everything it pulls in - I was using it on a minimal system and I didn't want all those things pulled in. It also means you can edit the meta-release file without being root. You only need root for editing the /etc/update-manager/meta-release file and then running do-release-upgrade. 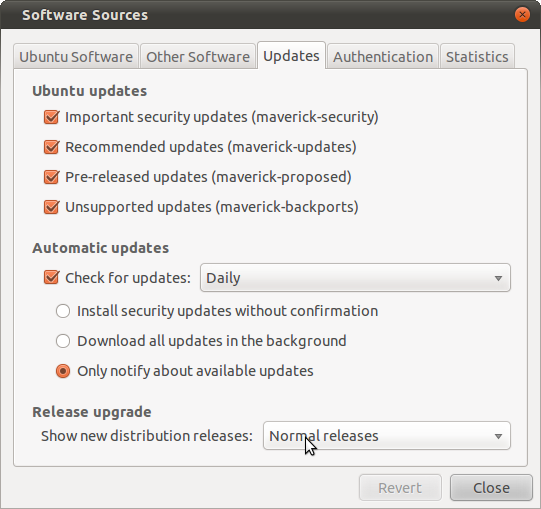 You can not skip a release when upgrading Ubuntu. So you will need to first upgrade to 9.10 and then from 9.10 to 10.04. Jaunty went out of support sometime back. The next version up from Jaunty (Karmic) is also out of support. You also, cannot jump intermediate versions i.e. not 9.04 to 10.4 - you have to go via 9.10. Since both Jaunty and Karmic have been removed from the main repositories, you best upgrade route is to download the desktop ISO of 10.04 and do a fresh install. You should of course, backup any non-hidden files in /home before the install. You can restore these after. For those who are planning to clean install, follow the steps below. What you will need: Separate disk, external HDD recommended. sudo tar czvf /media/$your_mount_point_of_external_HDD/mybackup.tar.gz /home # Backup your /home folder. sudo tar czvf /media/$your_mount_point_of_external_HDD/mysources.tar.gz /etc/apt/# Backup your repositories. Shut down, disconnect external HDD, and install the new system, adding the user with the same name. dpkg --clear-selections && dpkg --set-selections < /media/$your_mount_point_of_external_HDD/mypackages # With this you will reinstall the packages. This is all. Ofcourse this is not error free and it works just if the system has 1 user, etc. I've found a simple way to by-pass this problem and still upgrade online without the CD. Note: (updated 2014-07-25) see also Rubo77 answer here. It avoids installing Apache. Remove all version after Karmic, and change the line Supported: 0 by replacing 0 by 1 for Karmic. 6.1) Please make sure you have the following sources.list (/etc/apt/sources.list). After the upgrade, you can remove apache2, restore the system files (/etc/update-manager/meta-release and possibly /etc/hosts). but based on your error message, I doubt you will get any different results. I've been getting the same error, and I've yet to find a solution. Tell the upgrader that the current and next version are still supported - that part is not true, but it is required to make the upgrade work. and change the entries for "yakkety" and "zesty". Set "Supported" set to "1", and the resource links all to "old-releases". Run this once for each release step (from yakkety to zesty, then from zesty to artful, ...). I will not repeat the answers of others, but I do know how to achieve the effect of going from one old release to the latest. This requires access to another machine with a terminal and ssh installed so that you can automate the process by using ssh and a loop in the shell. Just to expand on previous answers, here is how to remotely do the same as the accepted answer, using a passwordless upgrade over ssh that will get your box upgraded to the latest version. It is copied off my own blog entry. All of these steps assume your package repository is working. Meaning if you execute apt-get update you are not presented with lots of 404s due to having an outdated version. You need to fix that first, so see this answer for that. Log out and execute the following command from your computer. It will do an upgrade without prompting you for input (accepting all default answers), wait for the computer to reboot, and then try upgrading again. It runs until you are upgraded to the latest version. Afterwards you will have to move the backed up config files to their previous location as the upgrade process has put default configurations in their place. Not satisfied with the default answers? Open a terminal, run sudo update-manager -d and you're off! Is it possible to upgrade directly from 15.04 to 16.04? Upgrade from 12.10 to 14.04 directly from ubuntu or clean Install? How to upgrade Ubuntu 12.04 to 13.10? Upgrading to Ubuntu 10.10 says it's still a Development Release? When (in-place) upgrading to 11.04 are existing installs transferred to Unity? Will upgrading disrupt online backup software (Crashplan)? Is it possible to skip releases during an upgrade? Upgrading from 10.10 to 11.04 to 11.10? Will upgrading from Ubuntu 10.04 to 10.10 delete my personal data?